The Trial of Joan of Arc is a fascinating film from the French director, Robert Bresson. 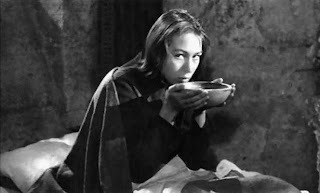 Bresson used as his source material in transcript of the trial of Joan in 1431 before the inquisitorial court set up to try her for her life. Using his peculiar directorial style which eschewed deliberately the use of professional actors (none were employed in the making of the film) and was exceptionally minimalistic, Bresson acheives a degree of focus upon Joan that marks out his film as a great study of an individual character. We have on the one side the inquisitors, mostly Monks and Bishop Cauchon and English soldiers and commanders and we have on the other side Joan herself, played perfectly by Florence Delay who uses the actual words that Joan used at her trial. The film is stark, very little of the dialogue is dialogue that Joan did not use and was not in the transcript but it still conveys an intense emotional power and is the prototype in many ways for films which try and maintain a realism through using the actual records of trials, like the recent German film made about the anti-Nazi heroine Sophie Scholl. To say all this though gives a false impression because this film is not merely a styllistic masterpiece but also a cinematic one. Florence Delay's performance lies at the heart of the film and it is worth analysing it a bit more if we are to understand what the film brings us in terms of any message or thought at all. Delay is incredibly impressive as the title character, she plays Joan with the minimum of artiface. What shines through from Delay's performance is that she isn't designing it in a historical way- this is Joan as an impressive, thoughtful, intelligent and honest young woman. The words though crafted by Bresson out of the transcript of the trial give this portrait a 14th Century realism that you would not expect from what I've just said and because Delay is attempting and succeeds in portraying Joan as sincere and intelligent suddenly the film viewer is evacuated into a different world. When Delay honestly and sincerely answers her inquisitors by saying that when approaching the King, an angel went in first and then she went in after- she says it with a matter of fact honesty that conveys more than any ammount of histrionics the reality of her beliefs. The inquisition itself is perfect as well. Again Bresson's direction gets to something that few films about this or any era manage to. The inquisitors are often indecisive in the way that they ask questions, more often than not they are impassive. The impressive way that the inquisitorial process- the judicial method of investigation by repeated question and answer- is drawn from the record makes one see the insides of a medieval trial. This is a film which concentrates not on the reality of the setting- Bresson's characters are dressed in the right clothes and in a castle but that's the only basic concession to the conventions of costume drama- but upon the reality of the ideas those characters are expressing. Symbolised perhaps perfectly in the moment of Joan's execution when the Bishop Cauchon hands her over to the secular branch which puts her to the flames- for a moment it captures the sincerity of his belief that he has not sentenced her to death but merely expelled her from the Church and surrendered her to the secular arm to do as it wishes with her. Jean Claude Forneau's interpretation of Cauchon is also interesting. The questions he delivers are precise and scholastic- testing for heresy he advances axiom by axiom through the beliefs of the peasant girl in front of him. The subtle scholastic distinctions made by the Bishop coming out of the trial record demonstrate the distinctions between his world and the world of popular piety out of which Joan proceeds. But the overall focus is the wonderful performance Delay gives as Joan. She manages to capture Joan's belief in what she is telling these men and also her simplicity and her youth. The petty cruelties she suffers in jail, she takes with a stoic assumption of her own eventual martyrdom and her confidence in her salvation makes her actions appear logical. Its very hard to imagine deliberately running towards the stake that will burn up one's remains, but by the end of the film when Bresson shows us a montage of Joan's running feet pacing the ground from the cell to her stake, the audience glimpses for a moment why a 14th Century visionary chose to die in that way. The final scenes are some of the most moving in cinema in an understated way because we know this character through her answers to questions. Bresson once said that in this film it was the sound which was important and the action on screen was a mere accompaniment to the sound- the acheivement of this film is that it takes an actress who had never acted and places her in a role where she acts a typical 19 year old girl who has received a vision and makes it beleivable. More than any other film I know this transports you backwards into the world of Joan and the world of the 14th Century where it is perfectly conceivable that angels would introduce peasant girls to Kings in order to save France, where any indignity was preferable to losing one's chance of paradise and where any suffering could be redeemed by the knowledge that such suffering was a martyrdom for the cause of the living God. LATER Apologies for posting an addition but it just struck me that an aspect of this film that I left out is a very important one. Bresson also attempts and acheives a distinction in the way that he portrays the faith of the individuals involved- Joan's faith is faith itself, just strict belief- her accusers are much more scholastic in their approach. There is an aspect here of another famous encounter- that between Christ and the Inquisitor in Dostoevksy's Brothers Karamazov. It shouldn't be overplayed- the clerics all have faith as well- but there is that aspect of a beleiver confronting the institution that is interesting and important to this film. The trial of Joan of Arc is a good movie but many people seem to prefer the older Passion of Joan of Arc.